You don't have to be a professional artist to be able to embellish your website with quality graphics. Simply use no-cost web graphics that are free for you to download! Right click the image that you want to use and save it to your computer's hard drive or an external storage device. The images below are designed for use in navigational structure. Choose your favorite fruit image. 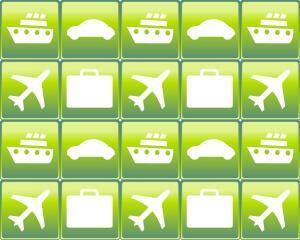 Select the travel icons that best meet your needs. 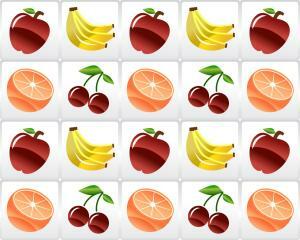 Embellish a website page with a fruit or travel-themed wallpaper design. Websites that offer free web graphics may specialize in a type of image, such as logos, icons, photographs, or wallpapers, or they may provide a selection of all types of images. The following list provides places to find most types of graphics and states any important usage policies for each website. Icons.MySiteMyWay.com: This site offers over 100,000 icons and clip art graphics, and it doesn't require you to link back or give credit to the site. Icons come in various colors and themes, and they are suitable for use on websites, in application graphical interfaces, and in web design projects. Open Clip Art Library: If you're looking for clip art images to decorate your website, this community site is a good resource. It offers thousands of free vector images in various categories, including food, transportation, cartoon, animal, nature, and countries. It also offers icons and symbols. There are no restrictions on using the images because they're in the public domain. New images are added continuously, and the site has a request page where you can ask for a certain image. PsdGraphics: This website offers numerous pages of webpage backgrounds and template images that are free to use on noncommercial websites. All of the images are high quality and come in either the JPEG or PSD (Photoshop) image format. The template images are especially useful to add items like clocks, calendars, business card, name tag, and product box images on your site. If you do need to use the images on a commercial site, prices depend on image size and type. While there are plenty of places out there to get free web graphics, that doesn't mean you can actually use these images legally. You need to avoid using copyrighted content without the owner's permission, and you should pay attention to each website's specific policies. Whether you need icons, backgrounds, or other supplementary images for your website, using free images from these sites can save you time and effort. They are also a good solution if you don't know how to create graphics yourself and don't want to pay someone else to make them for you. Best of all, using websites that allow you legal access to images will save you the trouble of dealing with copyright issues.